SAYAS and the Young Academy of Sweden (YAS) made presentations at a joint panel session on ‘Supporting young scientists to thrive in the research system’ held on 15 May 2018 at the University of Pretoria as part of the South Africa-Sweden University Forum (SASUF) Research and Innovation week 2018. SASUF is a collaboration between 30 universities in Sweden & South Africa together with embassies, civil society organisations, funding agencies & ministries in both countries. Prof Puleng Segalo, Head -Office of Research and Graduate Studies, College of Human Sciences, University of South Africa addressed gender dimensions and challenges faced by young researchers while Prof Esther Akinlabi, Vice Dean: Teaching and Learning, Faculty of Engineering and the Built Environment, University of Johannesburg spoke of contributions made towards meeting industry needs and addressing the 4th Industrial revolution. Dr Alisa Phulukdaree, Senior Lecturer, Department of Physiology, University of Pretoria made a presentation on the Africa Science Leadership Programme (ASLP) as an initiative aimed at equipping young scientists and early career researchers in Africa in science leadership. 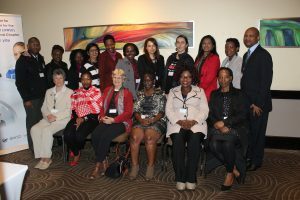 South African Young Academy of Science (SAYAS) jointly co-hosted a Research in Science, Innovation, Technology and Engineering (SITE) and Gender Roundtable together with the South African National Chapter of the Organisation for Women for the Developing World (OWSD-SANC) – hosted by the Academy of Science of South Africa (ASSAf) and Durban University of Technology from the 15 to 16 May 2017 at the Southern Sun Elangeni, Durban. The workshop was mainly funded through GenderInSITE, an international initiative to promote the role of women in science, innovation, technology and engineering. The workshop demonstrated how applying a gender lens to SITE can provide deeper insights, more effective programmes and more sustainable outcomes in the context of development. SAYAS was represented by Prof Puleng Segalo and Dr Naomi Nkealah. In an effort to build networks among National Young Academies of Science (NYAS), SAYAS facilitated the participation of Dr Fadzai Mutseyekwa from the Zimbabwe Young Academy of Science. The discussions included presentations, panel and round table discussions on why gender in SITE; misconception of gender in research; case study examples of the DUT Urban Futures Center and engagement; ethical research and gender equity; the missing links and challenges to achieving gender parity in research and innovation; Mitigating against gaps and strategies for building research excellence in Africa. Particular recommendations and outcomes were made which will feed into the report for the OWSD-SANC –SAYAS-DUT initiative to be shared with the network and strengthen mentorship programmes for women in SITE and sustainable development. The ‘Global State of Young Scientists’ (GloSYS) is a project of the Global Young Academy. This working group leads and guides empirical research projects investigating the context in which early-career researchers today work, and the challenges and motivations that shape their career trajectories. Among particular themes of interest are young scientists’ motivations to enter research, support mechanisms, access to mentoring, scientific productivity and challenges faced as well as funding, mobility, and gender inequities within the higher education/research environment. Using the knowledge we gain through this research, we develop evidence-based policy recommendations that highlight the ways in which young scientists can be better supported in their research efforts and career development. The Global State Of Young Scientists (GLOSYS) report released in 2014 served as the precursor study. The first regional GloSYS study (dubbed GloSYS ASEAN) explored these issues in the context of four countries in Southeast Asia: Indonesia, Thailand, Malaysia, and Singapore. The study integrated three different kinds of data: pre-existing data on key indicators related to each country’s young scientist population, responses to a survey created by the GYA, and data obtained through semi-structured interviews.